Looking east from above, Dericambus catches the returning sun. Pronounced as &quot;Jerrycams&quot;. 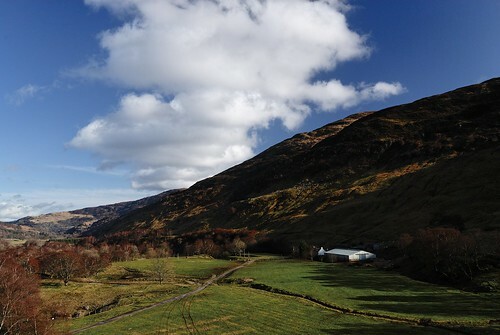 This hill farm nestles against the northern slopes of the Ben Lawers group. It loses the sun from mid October to mid March. The loaction has been a settlement for a long time. It is recorded by Pont as "Dirigams", probably around 1610.